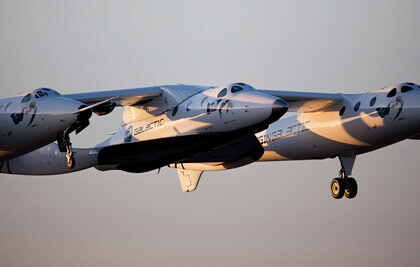 Virgin Galactic SpaceShipTwo, now dubbed the VSS Enterprise, completed its first flight March 22 — a captive flight while attached to its mother ship, the White Knight Two. This very first captive carry was a huge success and both the mother ship and spaceship looked absolutely stunning against the blue back drop of the skies above the Mojave Air and Spaceport. The VSS Enterprise test flight program will continue though 2010 and 2011, progressing from captive carry to independent glide and then powered flight, prior to the start of commercial operations.